Do the top 1% pay enough taxes? Do the top 1% pay enough taxes? Too much? The top 1% of households pay too little in taxes. That's the opinion of 55% of people surveyed in CNNMoney's American Dream poll. More women (61%) than men (49%) held that view. And not surprisingly, so did more Democrats (77%) than Republicans (33%). Straddling the middle were independents, 52% of whom thought the tax burden of the top 1% could be higher. Meanwhile, another 25% made up the Goldilocks contingent. 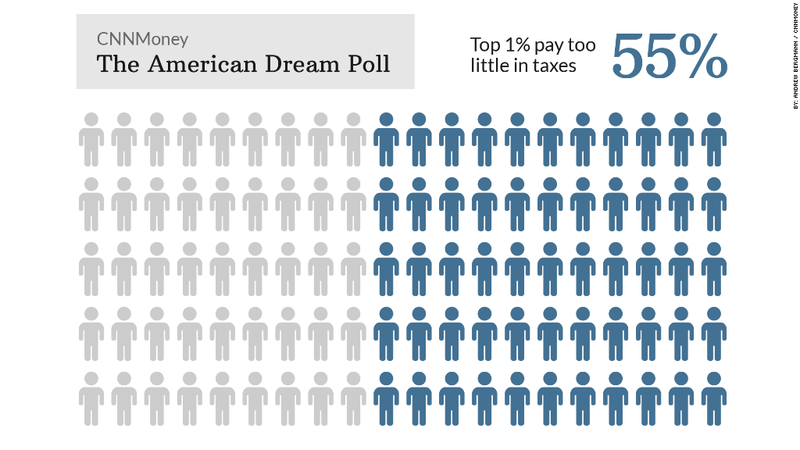 They said the top 1% pay "about the right amount" in taxes. Quiz: Do you have what it takes to be rich? And another 19% said they pay too much. The truth about taxes, of course, is that what's considered too much, too little or just right is a subjective, political judgment. It took at least $389,000 of adjusted gross household income (AGI) in 2011 to rank above the other 99% of U.S. tax filers. Of course, AGI doesn't include tax-exempt income, which can be substantial for the wealthiest households and lower the taxes they pay as a percent of their overall income. Related: How much income do you need to be happy? As a group, the top 1% earned nearly 19% of all AGI reported that year, but they paid 35% of all federal income taxes, which was about 2 percentage points less than the year before. And many in the top 1% faced a higher tax bill starting in 2013 thanks to measures in the fiscal cliff deal and the Affordable Care Act. The top income tax rate rose to 39.6% from 35%. Itemized deductions were restricted at high income levels. And, for the first time, investment income -- including capital gains, dividends and interest -- could be subject to the Medicare tax. Something else that's becoming clear about the top 1% of tax filers? Membership can be fleeting. That's because a sizeable number of households are catapulted into the group thanks to one-time events, such as the exercise of stock options or sale of a business.